Amityville Memorial High School students are spreading joy to others this holiday season through the Christmas Magic program. In early December, they shopped at Target to fulfill holiday wishes for 74 children, then went back to the school and wrapped all the gifts. The program was spearheaded by the Warrior Awareness Program, known as the WAC PAC, under the direction of adviser Jason McGowan. Gifts will go to Christmas Magic, a nonprofit organization that distributes toys to needy children. Senior Erika Garcia said that participating in the program shows that students at Amityville Memorial High School have good character and are willing to help others. Jayda Davis explained that every child deserves to have a special Christmas, and she was happy to help make that come true. 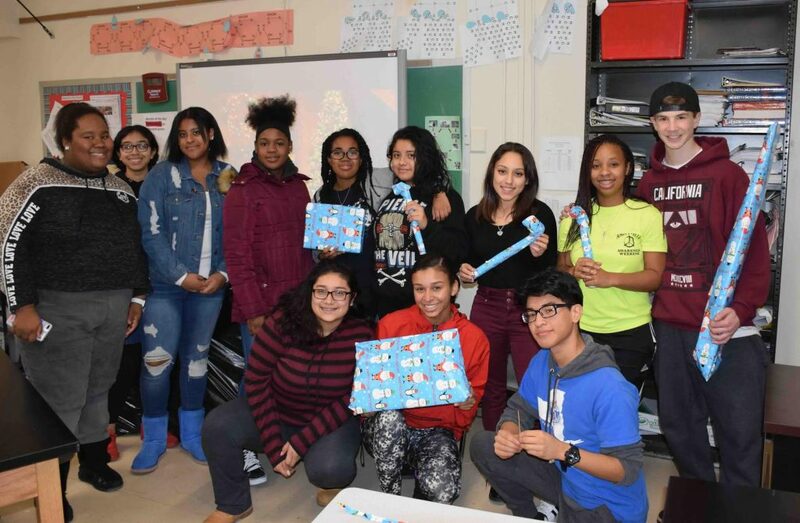 Photo caption: Members of Amityville High School’s Warriors Awareness Club recently purchased and wrapped gifts for needy children for the holidays.